June 13, 2017 By Allyson 38 Comments This post may contain affiliate links. Read my disclosure policy. 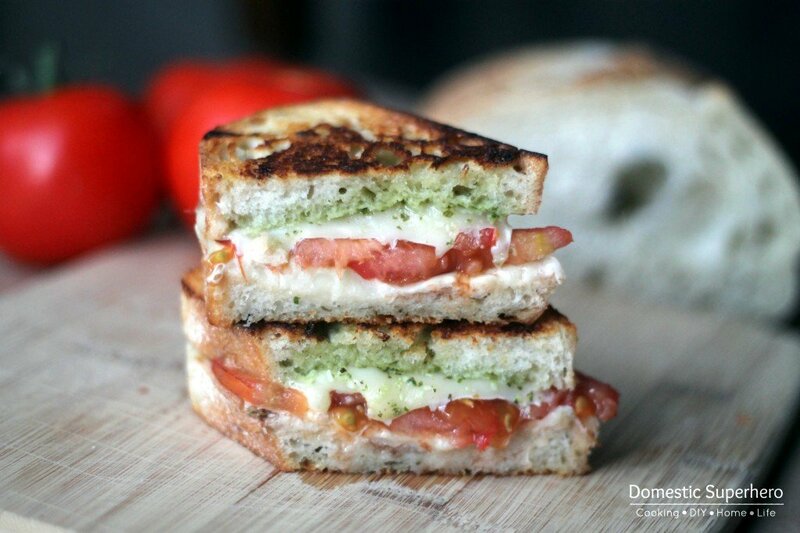 Caprese Grilled Cheese is stuffed with fresh tomatoes, mozzarella cheese & fresh pesto! Grilled to perfection & served pipping hot; the BEST fresh lunch! 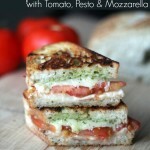 This Caprese Grilled Cheese Panini sandwich is seriously delicious. Not even going to sugar coat it or build it up, it is to.die.for. Make this for lunch, make it for dinner. Don’t wait, do it now. I was picking up my usual at Costco last week: quinoa, lettuce, and some pictures I had ordered, and while making my way back to the produce section, I passed by a ‘bread roadshow’. Basically someone was in the store, slicing up pieces of crusty bread and giving them out as samples. I noticed there was a huge crowd of people around them but why all the commotion? After I grabbed my huge bag of lettuce, I stopped by for a sample. OMG. This bread!!! This Rosemary Garlic Crusty Bread….holy moly! It was so so so good. I grabbed the required 2 loaves (2 for $5, yo!) and hurried to the checkout. Driving home I brainstormed what I could do with this bread…garlic bread? bread with cheese and wine? crusty sandwiches? grilled cheese? ding ding ding! I recalled having some basil, tomatoes, and mozzarella at home, and in that instant I knew that had to make a caprese grilled cheese!! I went home and made some pesto (just throw basil, Parmesan cheese, pine nuts, lemon juice, salt & pepper, and olive oil into a Food Processor …if you want extra creamy pesto, you could add a little mayo or Greek yogurt to the mix, I didn’t. ), sliced up the tomatoes and let them sit in some balsamic vinegar, and then put the Caprese Grilled Cheese sandwiches together (scroll down for full recipe). Of course if you don’t have a Costco near you, you could use any sort of crusty loaf bread from your grocery store’s bakery. Slice up your tomatoes in medium slices (should have about 12 slices for 4 sandwiches, or 3 slices per sandwich), and place them in a shallow dish. Pour 2 TBS balsamic vinegar over tomatoes. Let sit while preparing the rest. Butter both sides of bread lightly. Turn over, so butter is facing down. 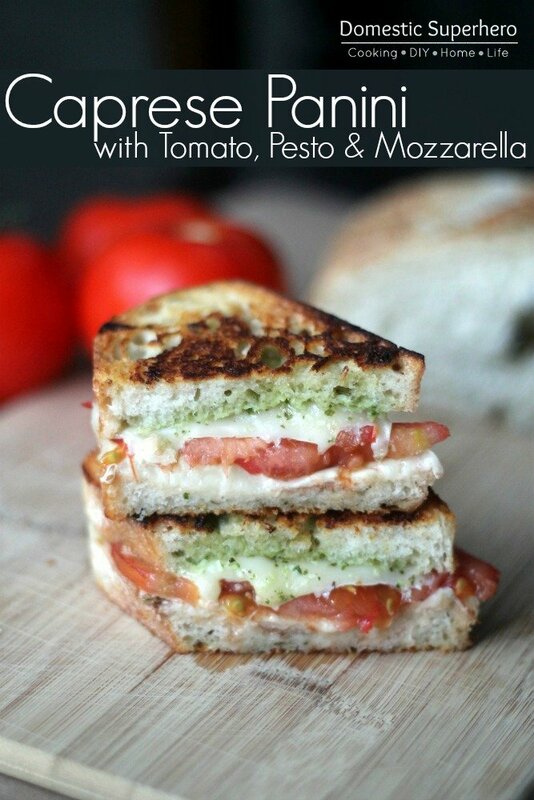 Top 1 slice with 1 TBS of pesto, add 1 slice of cheese, 3 tomatoes, and then another slice of cheese. If you like it really pesto-y, add some more pesto to top slice. Place top break slice butter side out. Heat skillet or panini press, and put sandwich on to cook. If using a skillet, flip when golden brown on one side. I cooked on a skillet for about 3 minutes on medium on each side. I cooked 2 sandwiches at a time and was easily able to flip with enough room in the pan. Repeat until all sandwiches are cooked. Cut in half with bread knife and enjoy! Liked Grilled Cheese as much as I do?! 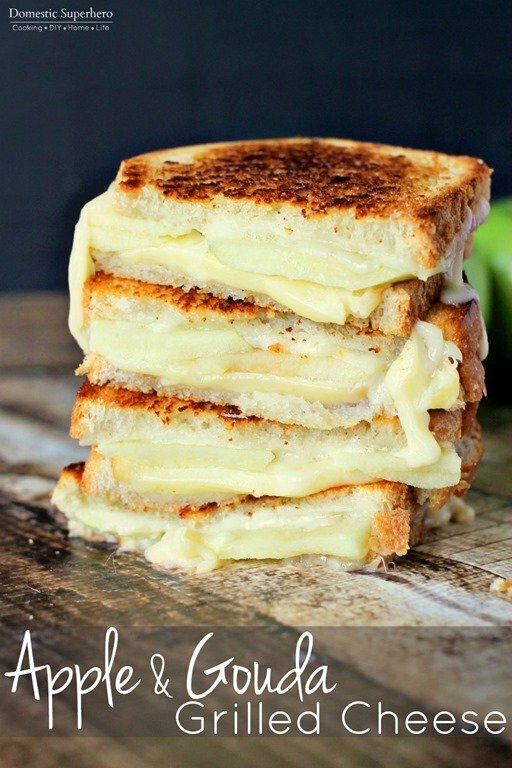 Checkout these other grilled cheese recipes! This really does look seriously good! It so sooo drool worthy! Thanks for stopping by! This looks delicious – simplicity is good! It’s amazing how the best things are made with the simplest ingredients! Thanks for stopping by, Katherine! This sounds like the perfect way to enjoy my end-of-the-season tomatoes! Thanks for the great idea!!! Good idea to use balsamic to season the tomatoes which always seem to end up tasteless & wimpy when used in a grilled sandwich… Thanks!!! Thanks, Lizzie! I totally agree with the limp tomatoes, no good! I also wanted the flavor of the balsamic, but I didn’t want to overpower by pouring on later, and also risk having the crunchy bread get soggy! This was a great compromise! Thanks for coming by! oooh, golly that looks good. You had me at tomato. This looks delicious! 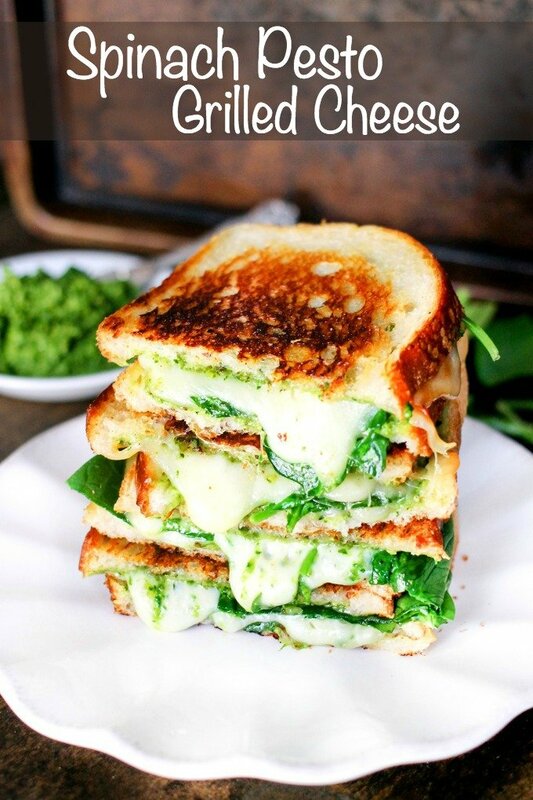 Thanks for sharing the sandwich and the pesto recipe above it. I have always wanted to make homemade pesto. I didn’t realize how easy it is! Pinning for later. It is super easy! Thanks for stopping by, Candace! This looks fabulous! 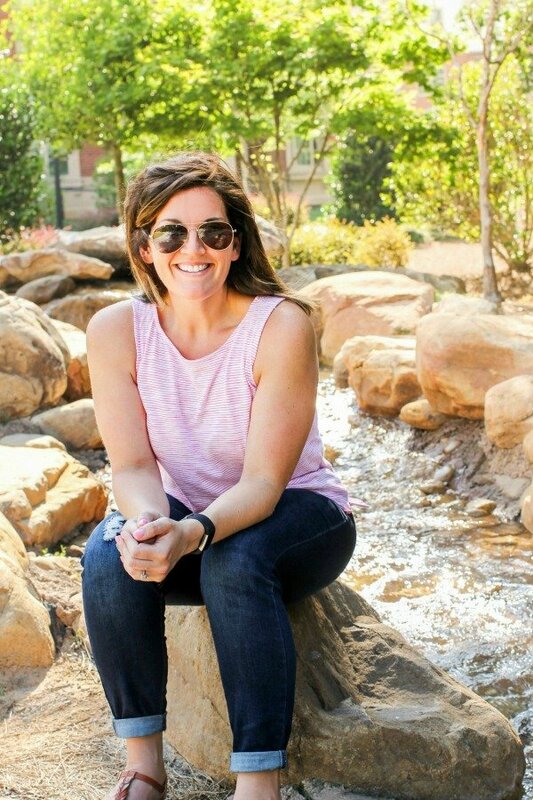 Found you on the linky party 🙂 Great photos and I love that you also keep your recipes separate so it’s easy to follow! Thanks Kelley! I love having the recipes separate so they are easier to print! All these sandwiches sound delish! I’m definitely going to try them! I had it today and it’s amazing, so simple and super yummy. Yay! I am so happy you tried it out and loved it! 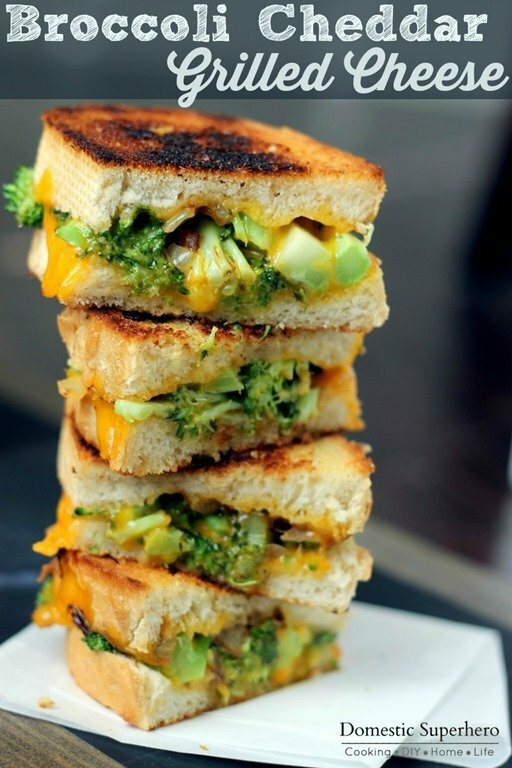 We definitely adore this sandwich at my house! I am diabetic so have to watch my butter intake, my trick is to use a pastry brush and coat both sides of the bread lightly. This works in a pan or a panini press. Thank you for the great sandwiches! That is a great idea! Sometimes I find I dont even need butter, just a little olive oil spray! So simple, so delicious! I try to eat very healthy, but my first thought upon seeing this was, we gotta add some bacon! Oh yeah, bacon would be great! Oh I am so happy you loved it! It’s one of my FAVORITE recipes FOR SURE! Sorry I just saw this, you can cover or not, it doesn’t matter and shouldn’t effect the outcome!